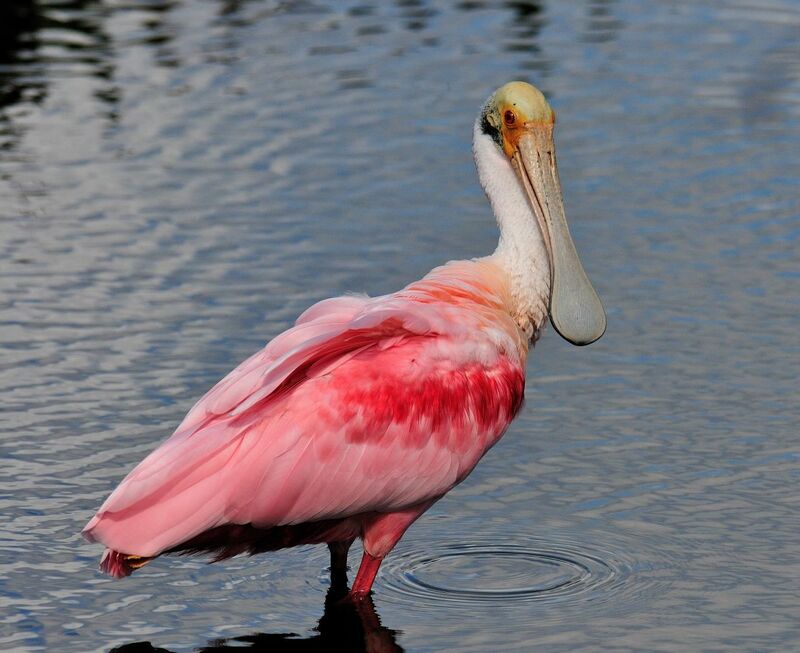 Today I want to write about one of the most colourful wading birds in the world, the roseate spoonbill. These beautiful birds grow up to 80 cm tall and have a wingspan of about 1.2 metres. Their strange shaped bills grow up to 18 cm long and are moved through the water from side to side to catch small fish, crustaceans and insects. Their bills are very sensitive and snap shut very quickly when they detect food. At breeding time, roseate spoonbills lay 1-5 eggs in a large nest built in a tree near water. The chicks are fed regurgitated food by the parents. They live in very large colonies and can often be found mixing with other wading birds, including herons, storks, ibises and egrets. Roseate spoonbills are found in shallow water throughout the southern United States, Central America and South America. They were once hunted almost to extinction for their lovely feathers, but now they are protected and their numbers have recovered. Are there any other interesting facts that you would like to share about roseate spoonbills?